“And of men is he who takes instead frivolous discourse to lead astray from Allah's path without knowledge, and to make it a mockery. For such is an abasing chastisement. And when Our messages are recited to him, he turns back proudly, as if he had not heard them, as if there were deafness in his ears; so announce to him a painful chastisement.” – Holy Qur'an, Surah 31, verses 6-7. When I began my last journey from Mexico to Los Angeles, then to Phoenix and on to Chicago and finally to Fort Lauderdale, Florida and ending in the Bahamas, intrigue and unsettling circumstances of a test were in the works. Little did I know that some of the hypocrites would be made manifest under the guise of good intentions for the Believer through deception and misrepresentation of truth and a business venture using satanic schemes. 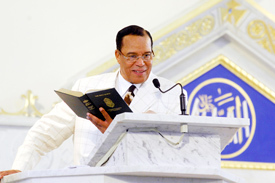 Minister Louis Farrakhan delivering Mother’s Day lecture May 10, 2009 at Mosque Maryam. Sunday, May 22, while in the Bahamas on a retreat with the MXODUS team, a turning point event took place which clearly defined the present course of actions in dealing with this heavy subject of the domestic life and the unveiling of the action being taken by the hypocrites and the disbelievers under the guise of the Number 19. Becoming further aware of the treachery at work, the unveiling began in Mexico, where I had received a few visitors in my home who were also members of the MXODUS coffee team. Among them a member who appeared on the scene was working mischief in our midst though appearing to be a trusted friend. He had initiated a course of a business venture without proper consultation and had stepped outside the moral standards and principle ethics of business practices. He continued to pursue his personal goals reaching out to the public with propaganda on the internet, causing deception and advertising, and confusion and bringing me into the midst of great dissension and turmoil which has affected my household and other family members in the community of the Believers. In the Name of Allah, the Beneficent, the Merciful, the Sustainer of the entire creation of the universe, the creator of all of us who make up the present family of the planet and all of the planets of our solar system and beyond, I greet my dear beloved sisters on this wonderful day which is dedicated to mother but it is more than Mother's Day would you agree? (Yes.) And we thank Allah for his coming in the Person of a well-made man, not a spook or an invisible being, otherwise we would be spooks and we would be invisible also. We are working with the laws of physics which makes manifest from invisible to visible. There was a time when we were invisible and we'll talk about that a little bit later. We thank Allah for His Coming in the Person of Master Fard Muhammad, the Great Mahdi, God in Person. We thank Him for raising in our midst from the mud of civilization one like us to guide and to teach and to bring us from this old world into an entire new world system and order of God--The Honorable Elijah Muhammad, the Exalted Christ, the Messiah--to know that we can stand here today and honor the Honorable Elijah Muhammad as the living Christ, the one that the whole world has been looking for, that he was born in a black manger, surrounded by beasts and animals in this Western Hemisphere. We are the people who are able to witness to the world that he's not over there in Palestine; he's not over there in Central Asia; he's not over there in Europe; he's not even down there in Argentina. He's not in the Islands of the Pacific. He's not in the Caribbean but yet he is in all those places all at once. But we are the little people, the little baby born out of slavery that the world did not expect that such a one would be born among us even though they read the scripture and they see the humbleness out of which Jesus came forth 2,000 years ago and I'll talk about that a little bit later. But just imagine how happy we should be today and every day that we can witness to the world. Now, we have to go beyond witnessing. We have to come forth with the proof, the scientific evidence that he is the Christ, that he is the Messiah, that he is the one that the entire world of mankind has been looking for coming up among ex-slaves, people who were considered to be no people at all. And we thank him for his prayer that one would be left in the classroom that would be guided by his spirit, by his light, by his Divine word to continue to take us on this rugged path as we reach out to the other side of a higher New World Order. and that one, as you know, is his very special Helper and spokesman, the Honorable Minister Louis Farrakhan. I spent this time to describe the essence of who these great, Holy men are so that we will honor and respect the Divine Teachings out of which we are being born today. So I greet you in the greetings of peace and paradise of As-Salaam Alaikum.